MASTER PROBLEMS Family and Home Improvement How to buy a family house? How to buy a family house? But those experienced in buying and selling property know that it is not all that simple. There are pitfalls into which the unwary or uninformed buyer can easily fall. Unless a person is careful he may become involved in a net of legal and financial problems that can leave him, not only without the house he hoped for, but deprived of the money he gave for the down payment. The decision of whether to buy or not to buy a house is affected by each family’s circumstances. One family may decide that it is better to rent a house or an apartment and avoid the responsibilities that go with owning property. On the other hand, another family, in order to provide a particular environment for their children and avoid the anxieties of uncertain housing, may decide to buy a house. There is no slide-rule calculation to determine the right decision. Perhaps the primary consideration if you are contemplating a purchase is your financial position. What monthly payments can you afford? How much money have you for the down payment? If you do not have enough, what sources for funds are available to you? How will you pay the money back? How much will the interest cost? It is wise not to underestimate the cost of owning your own house. For example, a person may look at an apartment for rent and then look at a house, the monthly payments for which, after the down payment, are exactly the same. So he may decide that, because the payments are equal, he can afford one as easily as the other. To be realistic, however, the potential buyer should add to the monthly house payments several other expenses, such as loss of interest from the cash used for the down payment, property taxes, insurance, heating expenses, water bills, maintenance and repairs. When these expenses are carefully calculated, the actual out-of-pocket cost of being in the house may be 50 to 90 percent higher than living in an apartment! Of course, there are also arguments in favor of buying a house. The new homeowner is making payments on something that he can eventually own. He may rightly argue, too, that apartment rents go up regularly, whereas now, with the exception of property taxes, he has reasonably stabilized his costs. Further, he may reason that with the spiraling inflation of the world’s monetary system, the best hedge to protect oneself against inflation is real estate. 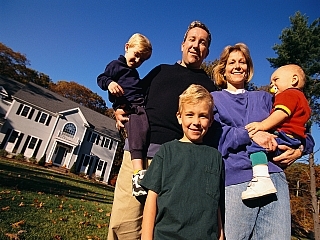 Another consideration that may weigh in favor of a house is the welfare of the children. The environment in the crowded atmosphere of many apartment buildings is not good. In fact, the owners of these often prefer tenants without children, and thus may not provide any kind of recreation facilities. While mother may have small jobs for her daughters around an apartment, many of the chores that provide such excellent training for boys, such as cutting lawns, shoveling snow and cleaning up the yard, usually do not exist. On the other hand, the apartment dweller may point out that when time is not consumed by these chores more hours are available to train children in various other worthwhile activities. Apartments just do not carry the load of extra work that is inescapable to the property owner. There are times, however, when one may decide that it is in the family’s interest to buy a house. But how can you arrange this if you should lack sufficient money for the down payment? You will want to examine the sources of capital that may be available. Loans may be obtainable at minimum interest rates through credit unions associated with your place of employment. Or you may find that if your credit rating is good, the local bank may loan you the needed cash. On the other hand, a relative may be happy to help out. But with the down payment borrowed, how can the homeowner expect to pay it back? Some families have purchased houses that are sufficiently large so that a room or two can be rented to tenants. The income from the rental is then used to pay back the loan, while other expenses are met by the family’s regular income. Such a method has been a successful avenue to property ownership for some. Just one word of warning if this should be your plan—be sure to buy in an area where municipal zoning allows you to sublet. A fine bit of advice to prospective house buyers is to shop around. In some places there are usually quite a number of houses available. First, decide generally on the area where you want to live. Find out all you can about the neighborhood. Drive around the area, not only to see what houses may be posted “for sale,” but considering such things as public transportation, location of parks and schools, and so forth. Always check the zoning regulations; otherwise you could eventually end up living near a glue factory! Sometimes a cruise through a neighborhood turns up a house for sale directly from the owner rather than through an agent. Such a direct transaction may result in saving several hundred dollars in sales commissions. When you narrow the quest down to three or four possible houses, a more careful examination of some details will often make one house stand out as the best buy. For example, consider the flow of traffic in the house. A house should be designed to provide maximum privacy in the area of the bedrooms and bathroom. Can you move from bedroom to bathroom without being seen from the living room? Will the children be away from the noise of the household if they retire early in the evening? Can you move from the kitchen to the dining room without passing through the living room? Is the kitchen large enough, both in which to work and to eat? Is ventilation satisfactory to remove cooking odors? Check, too, the soundness of the structure and its facilities. Is the heating system new, or is it nearing an early breakdown? If there is a basement, is it finished? Does it leak? If in doubt, try to inspect the house after a rainy day. How old is the roof? Are plumbing and wiring adequate and in good repair? If there is a fireplace, does it work? Is the lot well landscaped? It can cost hundreds of dollars to put in shrubs and trees. In deciding between three or four houses, some have found it helpful to make a chart listing such basic questions. They then check to see how each house measures up. Often such an analysis will clearly indicate which house to buy. But remember: Satisfy yourself before you buy. Once an agreement for sale is drawn up and signed, there is little use in examining the roof, foundation or any other aspects of the structure. It is too late then. So do not sign until you are sure to avoid problems. The next step is drawing up and presenting a formal offer to purchase. The offer is usually drawn up by the real estate agent, although the buyer will generally find it wise to have the document checked by his lawyer or some other competent independent person before it is signed. Be sure that all representations made by the seller or his agent are included in the offer to purchase. All verbal commitments pertaining to the transaction should be included in the written agreement. If you have any doubt about the heating system, roof, and so forth, the seller’s representations of these facilities should be written into the agreement. Also, if the offer includes any articles in addition to the house itself, such as rugs, refrigerator, stove, washer, lawn mower, all these items should be clearly stated. It is generally best to have even obvious articles, such as heating system, light fixtures, television antenna, included in the agreement. Such a carefully written agreement can help you to avoid arguments or even lawsuits. Before the offer is signed, check carefully that you are not facing any unforeseen costs. For example, is there a land-transfer tax in your area which must be paid to register your deed? Have you allowed for the normal “adjustments on closing,” which may include a three-year fire insurance premium, land taxes for part of the current year, or extra charges for fuel or prepaid utilities. Understand clearly the terms of your mortgage. Do you have the privilege of paying additional amounts on principal at any time if you wish, or is it a “closed” mortgage? What is the interest rate? Do your regular payments include principal and interest, or are they principal plus interest? Do you know how much of your payment will be applied against principal and how much is interest? Housing has been described as among the most important social problems of our day. As the population increases, and housing costs continue to escalate, it can only be anticipated that the problem will become even more difficult.